For many years, SAPIEN has offered on-site PowerShell Training across the United States. We receive messages all the time that highlight major interest, but some without follow through. The question is, why? What was preventing these companies from booking the training? After a bit of research, we found that more often times than not, there were not enough employees to fill a class and justify the cost associated. This got our brains buzzing. We already support large businesses with 15+ IT admins. So, how can we support smaller businesses and independent contractors too? staff from SAPIEN were very helpful, friendly, and responsive when issues came up (which was rare).” – Greg S.
After some very careful planning, we decided to bring Jason Yoder to Napa, and offer our same on-site PowerShell Training to small groups and individuals as classroom training! The event started on March 18th and lasted until the 22nd. We could not be more excited about how it went. People came from all across the United States, with one as far as Singapore! 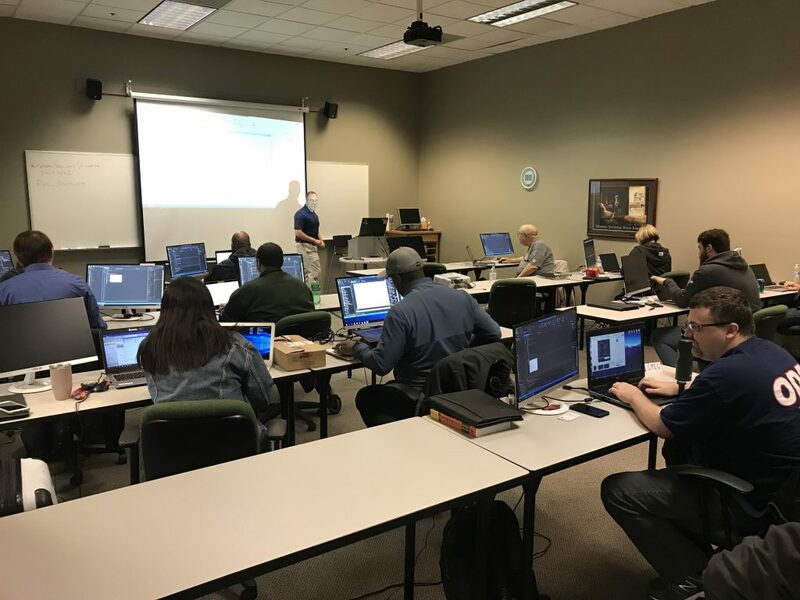 For five days, the class received our on-site PowerShell training through a series of lectures, labs and hands-on exercises. I was going to be able to test the code sooner rather than later, helped me stay focused during the lectures” – Daniel B. As SAPIEN’s offices were right around the corner, employees and owners had the chance to stop in and say hello. Our Senior Software Engineer, David Corrales, even spent some time in the classroom to answer questions related to our very own PowerShell Studio. It was so fun for us to have the opportunity to engage with people in-person! provides an engaging and structured course that really takes the fear out of learning to use PowerShell” – Juanita G.
“Mr. Yoder was outstanding. It is great when you have a VERY experienced trainer” – John D.
We could not have done any of this without our very special trainer, Jason Yoder. He is such an asset to SAPIEN, and the reason we are able to offer this course to our PowerShell community. We would also like to take the time to thank those of you who attended. Because of your interest, your attendance, and your feedback, this won’t be the last time we offer this classroom training. If you are someone who missed this, keep an eye out for future opportunities. Rest assured, they are coming soon! Not only will we be offering additional beginner courses, we will also be introducing advanced PowerShell training as well. If you are interested in being kept up to date with the latest training offerings, or if you have any specific questions regarding the course, please send an e-mail to sales@sapien.com with your contact information. If you are interested in bringing Jason Yoder to your company for on-site PowerShell training, we would be happy to help you at this e-mail address as well. You can also connect with us by phone at (707) 252-8700 Ext. 111. As one of the attendees’ of the class I spoke to Sapien Senior Software Engineer, David Corrales and explained an enhancement to the PowerShell Studio, specifically that the products complier would support the $PSScriptRoot variable. Which is critical if you want to use relative file addressing from the EXE. About a week later I received an email from David letting me know that this enhancement would be added to the product in a soon to be released version. WOW! Now that I have the product I know that using the built in feedback system will give me the ability to provide direct input to the Sapien Engineers. Thank you and everybody else at the class the great feedback! It was my pleasure meeting you.